While at a sewing class last week, I commented to the quilter next to me, that on my list of things to do was hemming jeans. She and then others jumped in, that they feared doing jeans on their sewing machines because of the thick seams. So I said I'd show them how I do it. 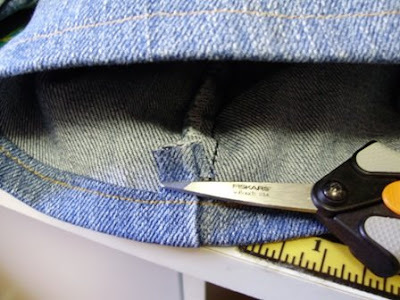 Here is my quick way for hemming jeans. I've tried many ways, and have been using this method for the past 10 years. Beware this is a long post... Simple technique, but many pictures. 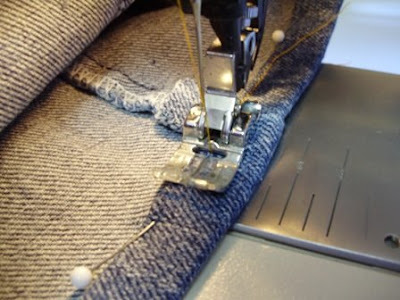 First set up your sewing machine to do a straight stitch. I use a stitch length of 3.0 and a heavier needle. A jeans needle or topstitch needle if you have one. Next, measure your jeans. For my husband, I have him stand on the floor in his sock feet and I pin up the jeans 1 inch above the floor. Then lay the jeans out on the ironing board and fold up the other leg so both are even. Iron up the hemline on both legs. Give a really good pressssssss... I use steam too... See the line it makes. This is a good guide. Next, cut about 1 inch down from the pressed line. I just eyeball it. But measure if you must. Set aside the bottom of the pantleg for a recycle project. Next take small snips about half an inch long, on either side of the bulky seams. Total of 4 slits on each leg. You can see the slits are on each side of the seam, about half way to the pressed hemline. Next, tuck in the raw edge of the hem so it is folded in so that your one inch of hem is now about a half an inch. Leave the thick seam sticking up. Do not fold it under. Pin all around. Notice that I pin with the heads of the pins sticking towards me, so I can easily remove them as I sew. Next, using ORANGE thread in the top and bobbin, sew near the top of tucked in fold all around the hem. In the early days, I was matchy matchy and used light blue thread. It looked awful. Orange is the color to use. 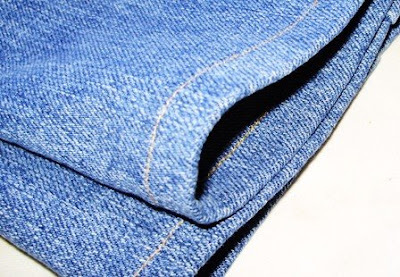 Unless, the jeans you are hemming were originally hemmed with a different color like white. I would use that as a guideline. Stitch right over the seams. 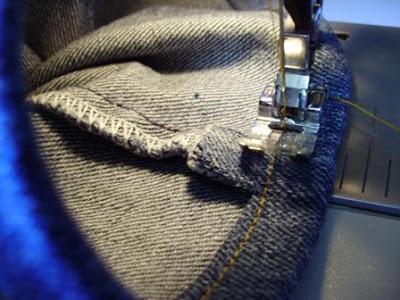 Most sewing machines don't have trouble with two layers of seams. Snip off the portion of the seam that is sticking out. Your jeans are hemmed. Since it's the bobbin thread that shows on the outside hem of the jeans, I keep a bobbin of bright orange thread in my bobbin caddy at all times. I primarily use it only for jeans and I think I've been using the same bobbin for 5 years. If I had the 10 years of hemming jeans back, I think I would have found a heavier weight of orange thread and used that in my bobbin. When this bobbin runs out , I will refill with a heavier orange thread. After Note: Denise left a comment that Joanns carrys Jeans thread. You can bet this will be on my list the next time I go to Joanns. Thanks Denise. Awesome ... neat idea about the inner leg seams. Iwouldn't of thought of that... makes total sense. I need to save this link! It's so much easier - no cutting required and you can hardly tell that it's been hemmed! 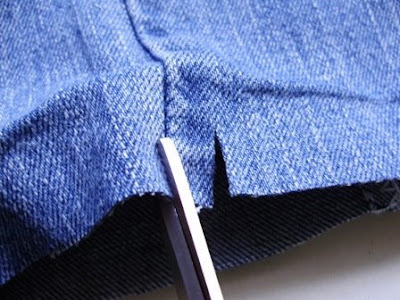 This looks like a great method of hemming jeans, a job I have always hated! I can't wait to try it. Thanks for the tutorial. 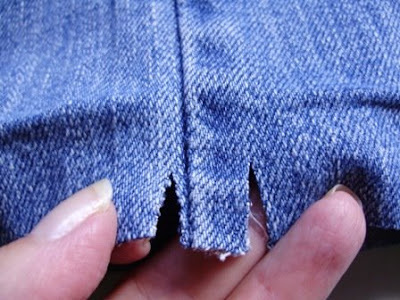 I love your clipping trick and will use that next time I hem jeans. Great tutorial! Good advice about keeping a bobbin of orange thread handy. Of course, your website would be quoted and there would be a link! Duh? Why didn't I think of this? I have been sewing for decades and hemmed a gazillion pairs of jeans and nothing like this occured to me. Thanks to Vicki W. for linking this post to her blog! I can't wait until somebody needs a pair of jeans hemmed! Thank you! That's terrific -- I have always been afraid to hem jeans, now I think I'll give it a try. Found this through a link on Vicki W's blog. thanks! I'll be linking to my blog! Thanks for the tutorial. I wish I had seen it before I hemmed my jeans. I found "jean thread" at JoAnn's. It is the perfect weight and color for jeans. Wow what a great tip! My husband and I are both short so I am constantly hemming things! Thank you!! How very cool - I do a lot of alterations for others. this will help me considerably! LOVE IT!!!! I am going to have to hem some jean for fun so I can try this! Thanks for making it look super easy. Great tutorial! Hemming jeans always gives me a bit of an anxiety attack, so I tend to just wear heels instead (I'm a shortie). I will definitely try this out with my next jean purchase! Great idea. I also use a Jean A Ma Jig which works great by leveling the pressure foot. Not my idea but I love it. Great tutorial. Just used to painlessly hem 2 pair of my daughters jeans. Super! Thank you for posting this tutorial and saving my poor old warhorse of a sewing machine many broken needles!! What a great way to hem jeans! Thank you soooooo much for this post, it is worth paying for if it was for sale, I have tried to hem jeans for years and had to much trouble, my husband has a longer torso with short legs and 29 length is to long I wish they made a 28, but anyway I have a big stack of jeans to hem and now I can get them done, thank you sooooo much. If your machine has a triple straight stitch it looks great for a hand hem, makes the thread look much thicker without having to deal with difficult threads. Thanks for the great clip tip! I will definitely give it a try! I also sew hems on the inside of the pant leg! It makes hemming so much easier ... I don't know who or why anyone ever showed me to turn them inside out first ... but I digress. Inside of the pant leg is the BEST! OKAY ~ So, I may not be the 'brightest bulb in the bunch' tonight ... but why would I want to use bright orange thread on jeans? When she says 'bright orange' thread I think she is referring to the orange color in the 8 count of Crayola crayons or maybe even the orange-red color in the bigger packs. I've never seen 'normal everyday' jeans with orange thread. They use a mustard/beige color in most pairs I've seen. It is available to purchase at sewing supply stores. Thanks again for the great tips! Wonderful idea, thanks for sharing but I'd love to add one step. After you've turn under the raw edges leaving the little flap unturned, using a hammer, gently tap the area around the flap. This flattens the seam making it easier to machine stitch. Wow! I've hemmed 100s of jeans in my life.... Wish I'd seen this years ago. I would probably add a little Fray Check on the raw edges, just as a precaution against raveling. I, also, have a Jeans Jig that allows me to travel smoothly over the thick layers. Ho accorciato molti jeans, anche per lavoro e molte volte ho avuto difficoltà sulle cuciture doppie, ma non ho mai usato questo metodo! Mi sembra una buona idea da realizzare nei casi più estremi. Grazie. Love the seam trick! Istead of heavier thread you can use the triple stitch function most machines have. It's what I do and it looks very authentic. So I tried this tonight, and mind you....I am sewing-challenged so not surprised at all that it didn't work. I used jeans thread and a 16 needle, and my underside stitches were perfect but the stitches on the visible side were horrible. I tore them out so many times and redid after reating about thread tension and finally gave up. I think I used a 4 stitch size. I even tried regular thread in the bobbin and still the stitches were awful. What am I still doing wrong???? This cannot possibly be that hard!!!!! That was great and easy to follow. Thanks for posting. Thank you so much. After years of hemming jeans, this is the best hint I've seen. Thank you! This is the best hint for hemming jeans or twill pants ever! Thanks for posting! 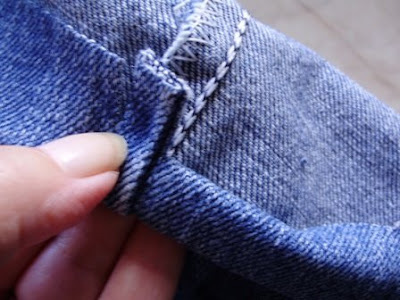 There is a better way...fold the hem of your jeans, pin if needed, place the folded hem on a sturdy surface and whack with a hammer until the folded hem is flat! Your machine will "walk" right over the thick seam, every time! What an ingenious idea... Thanks so much for sharing! Great tutorial. I will give this a try. I always use my husband's vice and squeeze the seams flat. That really helps and is apparently what they do at the factories. My old Sewing machine could sew over Jean seams with no problem, but not my new one. Sigh. I am fairly short so have had to hem jeans all my life and hated every minute of it. Thank you so much for showing me a new and easier way to do it! How clever - thank you! Shouldn't I need to worry about fraying right below part snipped off? Its a long way to the bottom of this post, but I had to say thanks. I notice you said to eye ball the length but I don't do that to well so I used a magic marker and put a black dot 1/2 inch on the top blade of my sissors . it helped with the distance and I can use a magic eraser to take it off when Im done. thanks again. Everyone brings their jeans to me to hem...thank you thank you! Great tips! I do hope you haven't given up on sewing! It can be a very relaxing and rewarding hobby, activity, or job! Thank you for the best sewing tip I've gotten in years! I'm sure I'll be using it often. I really appreciate it! Wonderful method. I wish I knew it 50 years and 1000 pair of jeans ago. Another trick - I clip the seam allowance at the hem line, turn one seam allowance to the other side, so I'm sewing over only one seam allowance at a time. Thanks, Betty R.
I also use seam binding or hem tape to reduce the bulk all the way around. 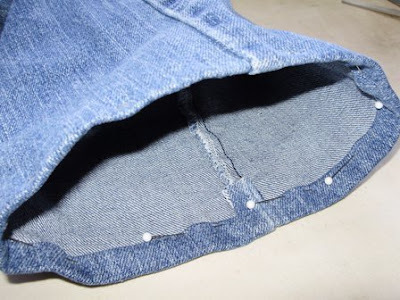 At the inside regular seam, clip the seam allowance on the hemline, and turn the seam allowance on the bottom edge to the other side to reduce bulk. Silver Sewer. I just saw this same technique on "Sewing with Nancy." Sure is a good way to reduce the bulk. Laying jeans around cement and hitting it with a hammer, flattens it right out. And old butterwick sewing tip. I made mine from scratch. This step is good as well. Brilliant! I found this on Pinterest and wish I'd have found it sooner!! I also hem jeans like you showed. When I finish the hem,I use fray check on the piece you clip off on the seam. The orange colour thread is actually called 'Old Gold' ... and I too keep a bobbin with this colour permanently on it! Great tip about the side seam,'I don't know how many needles I've broken powering over all those layers. My husband has been walking on the bottom of his jeans and i HATE the look. I am going to take care of the do to your Great tutorial! Great idea. I usually don't have much of an issue hemming jeans but I have a pair of flannel lined ones that I've been wearing too long for too long because I didn't want to face all of those layers at the seam. PS I keep some "just the right colour" DMC Perle #12 wound onto a bobbin for hemming denim jeans. 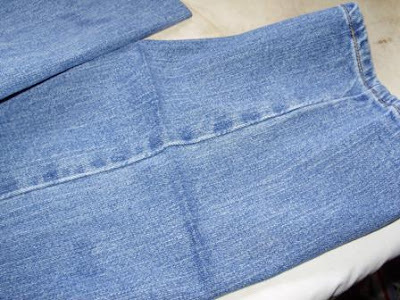 I just tried this method on a pair of my husband's jeans and it was SO easy! Thanks for a great tutorial...you have changed my life! Now I can get on and do all my sons' jeans and no more ragged hems. Thanks, I will do this. I have to hem all my jeans, as I am short. I also hem jeans for my cousin. This will help me a lot. Thanks a lot! I have never done this in such an easy way. I'll rell my sewingfriends here in Holland. If you have jeans that were hemmed in white or off white thread and you want to have a heavier thread to duplicate the original look use some crochet thread. I use the thinnest crochet thread available in my bobbin & it looks great. I thread two strands of regular thickness cotton through a jeans needle which gives the chunky thread look. 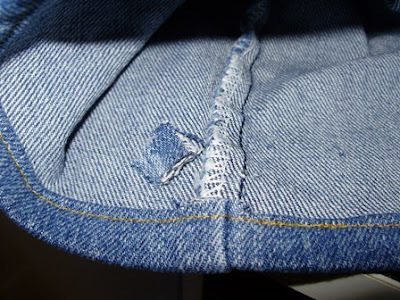 to hem jeans pin hem, do not cut out double seam fold ,pin take as mall hammer hit double seam I or 2 times to soften fabric but to break thread go slow sewing over double seam DO NOT USE MACHINE TO HIT ON,. use a wood or small metal to use under fabric to hit on , this has worked for me for over 40 years . Thanks it will help me a lot trying to go over those seams was awful. I found your post just in time, I have two pair of jeans to hem. Thank you!! Sounds like a great idea! Thanks!I feel like I have hemmed thousands of jeans in my life time for myself and family members. Anxious to try this. Sometimes it's the simplest things that make the biggest difference. Very clever!!! I have been hemming jeans for MANY years, but have never seen this technique. Will try it on the next pair of jeans I hem. I use my viking se and Ruby royal and my Janome 6500 quilter and it sews right over my Jean seams.If you have a light weight machine, it won't sew through it...this is where the saying" you get what you pay for" rings true. ..
Great tutorial. Coats and Clark makes a heavier weight thread just for jeans. I have tried it and it works well. Don't make the mistake of using it as your top thread like I did! Works best in the bobbin. I would put a drop or two of Fray Check on the raw edge of the snipped seam. This will keep the raw edge from fraying when laundered. This is brilliant! Thank you for sharing. Now to that stack of jeans I've been ignoring. I've been taking up jeans for years, wish I'd known this tip can't wait to do my next Pair! Great tip! I have broken several needles each time I sew my jeans. What a great idea! I fight with that bulky seam and I can't tell you how many needles I've broken sewing them. Thank you for saving me. OMG, I have been sewing for seventy years and always cringe when I have to hem jeans because I am vertically challenged at 4' 11"" I even tried buying 3/4 length but it didn't quite make it. I could hug you for making the last quarter of my life so much easier. Thank you from the bottom of my heart!!!!!! Just tried this on my husband 's jeans. So simple, but so clever! Works a treat. Thank you very much. As a seamstress who hems jeans all day long. Its easier to just fold it and use a hammer to smash it down. Its quicker and it goes through any machime very easily!!! 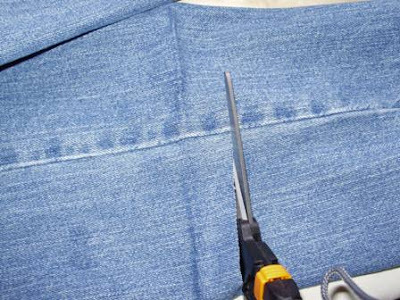 As a seamstress who hems jeans all day long its easier and more efficient to just fold the get hammer it and sew it all down. It looks much better, your customers are much happier and it will go through any machine easily if you use a 100/18 needle. Thanks for an easy tutorial, much easier on my nerves, and is neat and tidy finish which will dry easily. I love this post! I lost some weight and my jeans were looking really baggy going from size 18 to 14. Being 5' 1" I have to hem all my pants. I just hemmed four pair of jeans in the time it used to take me to do one pair. I didn't break any needles using your techique for the side seams. Thank you for sharing! This is ABSOLUTE GENIUS!!!! Thank you so very much!!! Great idea. But if you use titanium needles, you can just glide though the many thicknesses with out any problem. First Fiddleheads of the year!